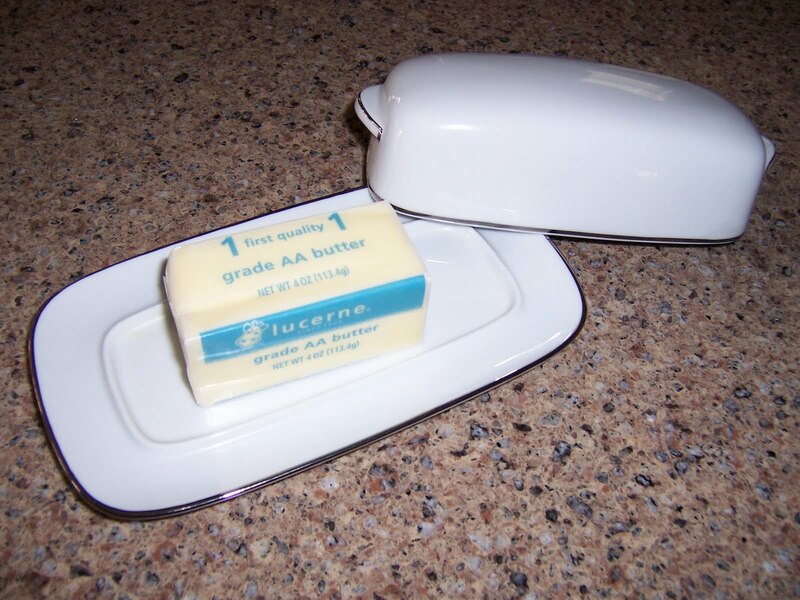 On Easter morning I pulled a stick of butter from the refrigerator, peeled off the paper wrapping and placed the one by three inch rectangle onto my china butter plate. I grew up eating margarine. Oleo we called it back in the ‘50’s. “Connie, put the bread and oleo on the table, please,” my mother would call from our turquoise kitchen. And so began my life with plastic tubs of margarine. There were changes over the years of course: brands, colors, textures, the size and shape of the container. I used Fleischmann’s for many years. When I look back, I wonder now if it was simply a monetary decision on my mother’s part. Just after WWII, perhaps butter was rationed. I never questioned it. I remember going to my Granny’s house in Louisiana and being a pain in the behind. Granny had cows on the farm so of course she had fresh milk and cream daily, and she made the butter in the old wooden butter churn. No sticks in those days. Growing up on Oleo, the butter just didn’t taste “right” to me as a child. So as my granny shook her head and mumbled under her breath, my daddy would obey my mother and head into town to the grocer. Every summer visit became a test of wills. Granny and Mother, Mother and Daddy, and me the root cause. I began using butter to bake when I had my own family and lived in Minnesota. But for daily use, it was expensive and as far as I was concerned, chemicals simply tasted so much better. Did you ever notice when you first open the container, how perfectly shaped margarine is – just the slightest tiny curl in the very center. I almost hated to ruin its perfection when I first took my knife to the tub. It’s funny how we become accustomed to so many things from childhood. We attach and hang on and fight any change. If my parents did it, it had to be right, normal, better, the best. Even when I learned that all those flavors and textures came from artificial ingredients, margarine stayed in my refrigerator. For forty years, in fact. But this year once that stick of butter came out, it stayed on the plate. Partially because we used two tablespoons at most that day, but partially as a symbol of change. It is healthier, even with cholesterol being a concern for Americans. It is natural (as far as I know). And perhaps it is a symbol of letting go of the past. A much bigger topic for another time. So—butter or margarine? Miracle Whip or Mayo? Brown mustard or yellow? Sugar or saccharine? What’s in your kitchen and do you remember why it is there? This entry was posted in Uncategorized on May 17, 2011 by cwesala.